Ages 4 through 8. This book is designed to help young children with language learning disabilities develop listening comprehension and story sequencing skills. Short picture stories with simple sentences are included. Each story is read to the student and the student is asked to retell the sequence of events. Students are also asked to respond to questions about the story action. 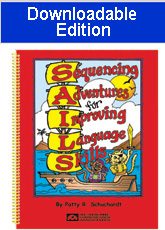 Each story includes four reproducible pictures for use in the sequencing activities. Two levels of difficulty are included for each story. The "Level 1" version includes shorter sentences and fewer details than the "Level 2" version. Therefore, Level 1 is often more appropriate for children who use a limited variety of sentence types. After reading each story, ask the questions that follow. Then ask the student to retell the story. Student workbooks can be created using children's version of the stories and the reproducible pictures in this book. Story pictures can be reproduced for use as sequencing cards. Place the pictures on the table and ask the student to arrange them in the correct story sequence. The high-interest stories motivate student to participate actively in the learning activities.